That High Tech Go-Karting Track In Singapore You Didn’t Know About! If there’s one place to know what it is like to step into the shoes of Lewis Hamilton, this would be the only place in Singapore to do it. The Karting Arena, which most of us might not know of, opened its doors to the public in September last year. It is a fairly high-tech electric go-kart racing circuit which caters to the casual and semi-serious alike. 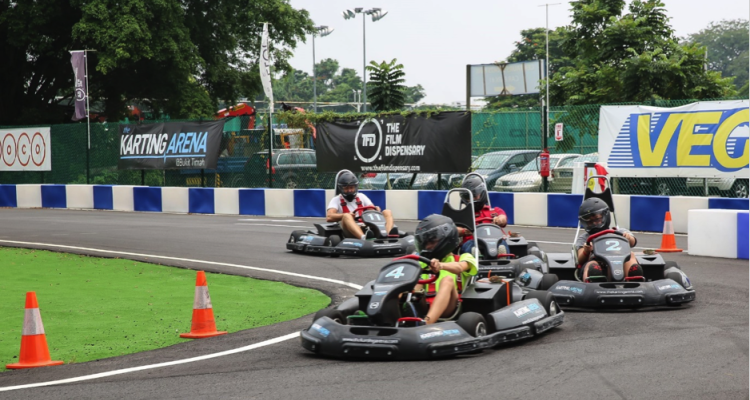 The very first of its kind in Singapore, its electric go-karts operate on battery instead of petroleum, promising a seamless and quiet whizzing ride to customers. Its very own circuit is 500m long and racers are put through The Karting Arena’s own twisting and turning track that seems fairly beginner-friendly yet proves not to be entirely smooth sailing. For the light-hearted who still wish to experience the thrill of the race, The Karting Arena is equipped with networked racing simulators where both the young and old can challenge friends and family on a virtual track from the comfort of an air-conditioned room. And trust me when I say this is nothing like a Daytona video game at your neighbourhood shopping mall arcade; its simulators let players pit themselves against one another through a real-life professional Formula One race track, or even in their own circuit just a few metres away from where you would be seated. To put into perspective of how intense the actual go-karts here can get, racers without a driver’s license are capped at a 30km/h speed limit for safety reasons, whereas those with one are free to reach the higher 50km/h speed. If you thought the go-karts in theme parks were adrenaline pumping, wait until you strap yourself on at The Karting Arena. And the price to enjoy this adrenaline rush? S$50 for first timers, and cheaper if you are a regular. This article originally appeared on Discover Singapore.